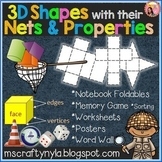 Great introduction to four basic 3D shapes. Includes one attribute sheet that is to be filled out. 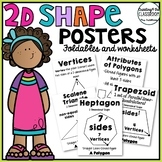 Also includes a sorting cut/paste shape sheet. Includes: Cube. Cone, Sphere, Cylinder, Rectangular and Triangular Prism. 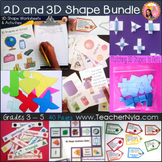 This download is all about 2-D Shapes! 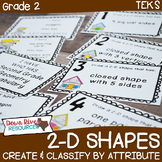 This is a hands-on worksheet incorporates color, shape recognition and shape attribution. This worksheet is meant for colouring, filling in the blank and cut into labels. Each Label has a shape name written on it and "Sides and Verticies" to fill in the blank. 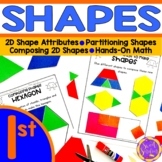 A worksheet aligned common core math standard 2.G.A.1 primarily focusing on plain shapes. Made on power point so you can cater to your class' needs. Enjoy! 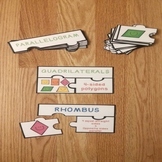 Worksheets for shape attributes! 5 worksheets. Riddles, sorting, must haves, how manys. 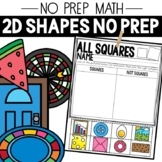 Included in this file are two worksheets with answer sheets that cover each of the following skills: 2.G.1 Recognize and draw shapes having specified attributes, such as a given number of angles or a given number of equal faces. 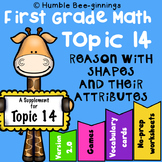 Identify triangles, quadrilaterals, pentagons, hexagons, and cubes 2.